The Waveform is generally considered the most robust exposure tool because it plots your image's luminance (brightness) -- and chrominance if using RGB mode -- to a graph but unlike the Histogram, it physically matches the screen from left-to-right. *New firmware 3.0 feature - Waveform now has a ‘spot meter’ function for a detailed look at specific areas of your shot! Although SmallHD provides many available tools to help with setting proper exposure, most of the decision will be down to what works for you. Use this section if you need help deciding where to start. The Waveform is an extremely comprehensive exposure tool but when needing to understand your exposure levels from a quick glance, Exposure Assist or Zebra may be better options. Once you get comfortable with how the Waveform works you can quickly reach optimal exposure with it by balancing exposure between the top and bottom of the graph to make sure highlights and shadows aren't being clipped too harshly. If they are, perhaps adding some light into shadow areas or diffusing/filtering highlights can help compensate. Zebra is generally considered the simplest (and often fastest) way to gauge exposure at the expense of customizability- if you don't wish to be distracted with the extra information a Waveform provides, give it a try! 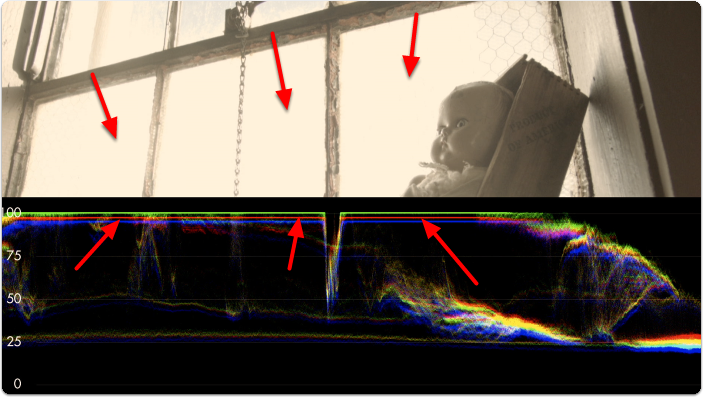 Waveform is often considered the best exposure tool because it allows very precise measurement of all aspects of the image's luma (brightness) and chroma (color) by setting the 'style' to RGB. Because the Waveform gains the most benefit when using the full width of the screen (so that it matches the image horizontally) it might consume more of your image than you are comfortable with. Try the 'Zebra' tool for an exposure aid that consumes a minimal portion of your image. To set exposure with the Waveform, first add it to a page. Press right on the joystick or tap the right arrow next to 'ADD NEW TOOL' and navigate to Scopes > Waveform and select to add it to the current page. Once added you can edit the settings by navigating right when ‘Waveform’ is highlighted. 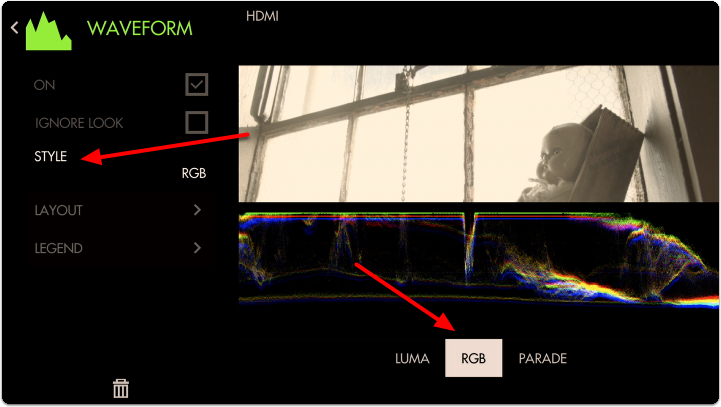 Select ‘Style’ and switch from LUMA to RGB - this will let you observe each Red, Green and Blue value simultaneously - a unique benefit of the Waveform. Back out of the Edit Tool menu to observe the waveform in action and to accurately expose your footage. The Waveform ‘flattens’ at the top when highlights are being blown or 'clipped' - this will result in footage that is a solid 'block' of color without the ability to manipulate it meaningfully in post production. Rolling exposure downwards, the lines 'un-flatten' and much more of the window can now be manipulated in color grading while some areas remain overexposed. If we keep rolling exposure down (closing the aperture) we will continue seeing more 'into' the brighter details at the expense of shadow details which become 'crushed' or 'clipped' and effectively lost similar to overexposure. 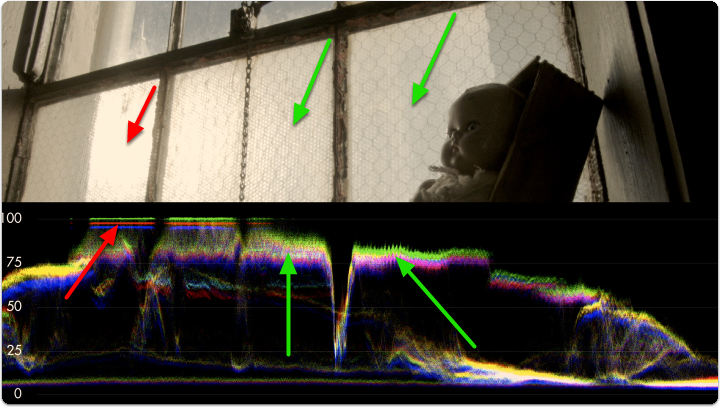 The key to finding a healthy exposure relies on a graceful balance between clipped highlights (top of graph) and crushed/noisy shadows (bottom of graph). The difference between the darkest and the brightest areas that a camera can effectively see detail is known as its dynamic range - this is why high dynamic range is a highly sought after feature among cameras; you are able to capture and therefore manipulate more of your image. As mentioned before, because we’re looking at an RGB Waveform we can can use it to make color decisions in addition to luminance. 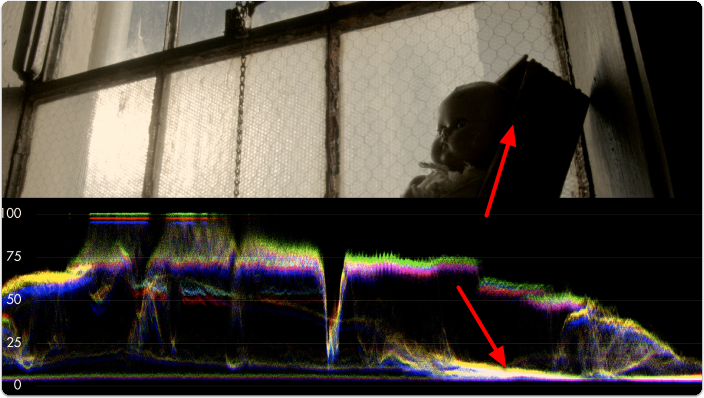 If a pure white or pure gray element occupies part of your scene, you can white balance with the waveform. Notice how adjusting the white balance setting on the camera shifts the RGB 'bands' - when lined up they turn white, indicating a proper white balance setting. 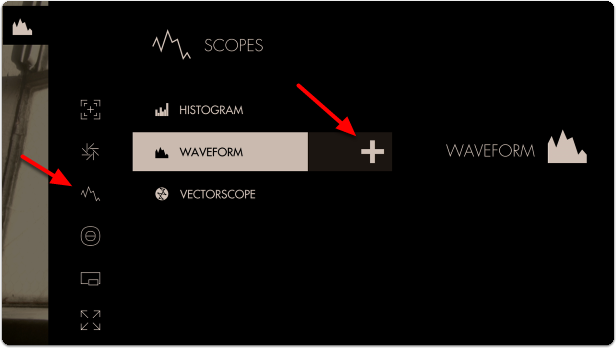 Access the Waveform's settings menu by navigating right or pressing the right arrow when the Waveform is highlighted. Allows you to apply a Look (3D LUT) to your footage while monitoring a waveform that is not affected by the Look. This lets you make exposure decisions based on the signal coming from the monitor for ideal flexibility in post-production. We recommend leaving this on for most shooting scenarios so that the waveform applies to the footage being recorded instead of shifting around while adding or adjusting a 3D LUT. Pick your flavor of Waveform- LUMA displays a brightness/luma plot only while RGB graphs each primary color on top of one another. RGB PARADE physically separates the Red, Blue and Green channels into discrete sections from left to right so they can be viewed easily in isolation. Set the positioning, scale and visibility of the Waveform. Displays the waveform in a full-screen view, useful when viewing from a distance or if using multiple monitors where another can be displaying the image itself. We recommend leaving this at 100 (or set to the same width as your image) to gain the benefit if the graph matching up evenly with your image from left-to-right. Set the location of the Waveform to a spot of your choosing - useful when placing multiple tools/scopes on screen. Adjusts the brightness of the waveform graph (the plotted portion) - increase if the graph appears too faint. Adjusts the transparency of the black background behind the Waveform. For better visibility, boost Intensity to compensate for a lower Opacity if desired. Brings up a small, moveable ‘window’ you can place on the image that highlights the portion of the Waveform it corresponds to. Useful for getting very specific exposure information from a specific part of the image such as skin tones, hot spots or calibration charts. Toggles visibility of the Spot Meter. Adjusts the width of the Spot Meter. Scales the height of the Spot Meter. Set the location of the Spot Meter to an area of your choosing. Places a guide onto the Waveform graph listing numeric IRE (brightness) values for measuring levels. Toggles visibility of the legend on/off. De-clutter your waveform by decreasing its number of labels or increase this for more granularity. Change the legend color if in need of extra readability of IRE values. Change the line color of the graph to more clearly see when your values are reaching a specific level. Adjusts the opacity of the graph lines to make them stand out - or invisible to improve graph visibility. Adjusts the thickness of the graph lines for readability.